The new Protector Version 45.0 is available for Hardware & Virtual Appliances. Take advantage of the new Extreme Anti Spam functionality. Improved description in the Antispam setup. Anti Spam: The default size above which a mail is not scanned against spam or viruses has been raised to 600k. Anti Spam: New option to set the score removed by the RP_MATCHES_RCVD rule to zero. The license status has been added to the System Status, to avoid that an expired license shows "System Perfect". Anti Spam: New option to raise the score subtracted by the SPF_HELO_PASS rule, to benefit mail with valid SPF record. 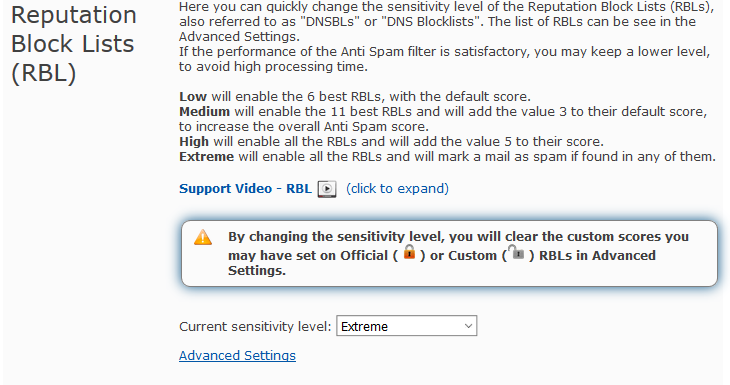 Anti Spam: New action taken when a new RBL level is set, to easily block mail that is listed in at least one RBL. Anti Spam: New option to change the time when the daily report is sent. Bugfix: a SQL error occurred when trying to update the recipient of a quarantine report. New message on screen to instruct users on how to bypass the 1000 items boundary on LDAP queries. Rewrite of the SMTP check process, to avoid any false Not Good in the System Status. New popup on 32 bit units to show benefits of 64 bit. Anti Spam: New option to block non admin users from adding domains to the block/white lists for all users. Firewall: New option to block incoming/outgoing ports and ICMP protocol. SMTP management: improvement to avoid unused mailers in the configuration files.